FILE PHOTO - The new Boeing 787-10 Dreamliner taxis past the Final Assembly Building at Boeing South Carolina in North Charleston, South Carolina, United States, March 31, 2017. SINGAPORE - Singapore Airlines Ltd said on Friday it will finalize an order for 39 Boeing Co aircraft worth $13.8 billion at list prices when Singaporean Prime Minister Lee Hsien Loong visits Washington D.C. next week. The airline said in February it would order 20 777-9 and 19 787-10 widebodies as part of plans to modernize its fleet over the next decade, but the deal is yet to be finalised and placed in Boeing’s order book. 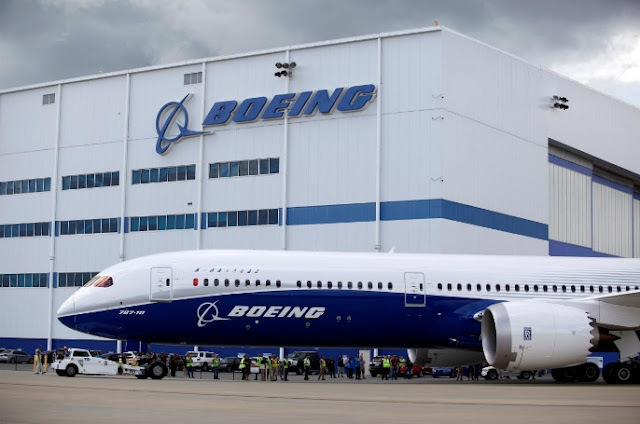 Lee told CNBC television on Thursday that he hoped to sign an agreement with Boeing to buy more aircraft for Singapore Airlines during his U.S. visit from Oct. 22 to 26. Singapore Airlines is investing in modern, fuel efficient aircraft despite undertaking a strategic review designed to help cut costs amid growing competition from Chinese and Middle Eastern rivals. While the Boeing order is worth $13.8 billion at list prices, airlines typically get discounts on jet orders. Jefferies in February estimated the deal’s value at closer to $6.5 billion, or about a tenth of the U.S. planemaker’s annual volume. Singapore Airlines Ltd said on Friday it will finalize an order for 39 Boeing Co aircraft worth $13.8 billion at list prices when Singaporean Prime Minister Lee Hsien Loong visits Washington D.C. next week.